Classic Cannoli Dip – A creamy dessert dip made from whipped cannoli filling using real marscapone cheese and served with chocolate chip cookies! Today’s recipe is the perfect accompaniment to any tailgate or “homegate.” We’re all about homegating – where we host a watch party with all of our friends. There’s nothing like watching a game on a couch with unlimited supply of food in an air-conditioned room. I’ll take that over a tailgate, any day. Today’s recipe is a dessert dip. Dessert dips are quickly becoming be new favorite way to feed my sweet tooth. Not only do I get to eat a sweet dip, but I also get to dip other sweet vessels into said dip. It’s a double-dose of sweetness!I present to you my Classic Cannoli Dip! I’ve been obsessed with cannoli ever since we went to Boston. I loved cannoli before our trip. But that trip turned me into a full-fledged cannoli addict. If you’ve never been to Boston, there’s a pastry shop called Mike’s Pastry in the heart of Little Italy. We went to Mike’s Pastry three different times, where I bought three cannoli each time. That means I ate nine cannoli in 3 days! NINE! So when we returned from our trip, I knew I needed to make cannoli for myself. But I didn’t really want to go through the effort of frying cannoli shells and stuff. So what’s the next best thing??? Making a dip! This cannoli dip is made just like authentic cannoli filling, except with marscapone cheese added to help thicken it up. Marscapone is like cream cheese, but not as sweet and tangy. I don’t recommend substituting it, though, because I think the dip will taste more like cheesecake dip than cannoli dip. I’ve seen a few cannoli dip recipes out there and they use waffle cones as the dipping mechanism. I think these are a great substitute for cannoli shells because they have the same crunch and texture, though the flavor is slightly off. But what I think is an EVEN better dipping mechanism is a chocolate chip cookie. Cookies go best with milk so it just felt natural to pair it with the dairy-based dip. To be honest, this magical pairing was a complete and utter accident – chocolate chip cookies were all I had in my pantry when I made the dip for the first time. But trust me when I say, you will not want to pair anything else with this dip. Promise. Make sure to use whole milk ricotta. In order for this dip to get whipped and creamy, you need that fat from the whole milk. When you first start whipping the ingredients together, they will be thin and runny, almost like melted ice cream. But trust me – you just need to keep whipping it to help fluff it up. This dip is loaded with chocolate chips, but feel free to use any other cannoli toppings that you love – chopped pistachios would make an excellent addition here. Don’t make this dip too far in advance – the dip will collect a little bit of liquid at the bottom after a couple days. You can just stir it back in, of course, but you’ll lose the pretty presentation of chocolate chips on top. There you have it – a yummy dessert dip for your next tailgate, party, or, hey, even a normal Tuesday night. This is a judgement-free zone. 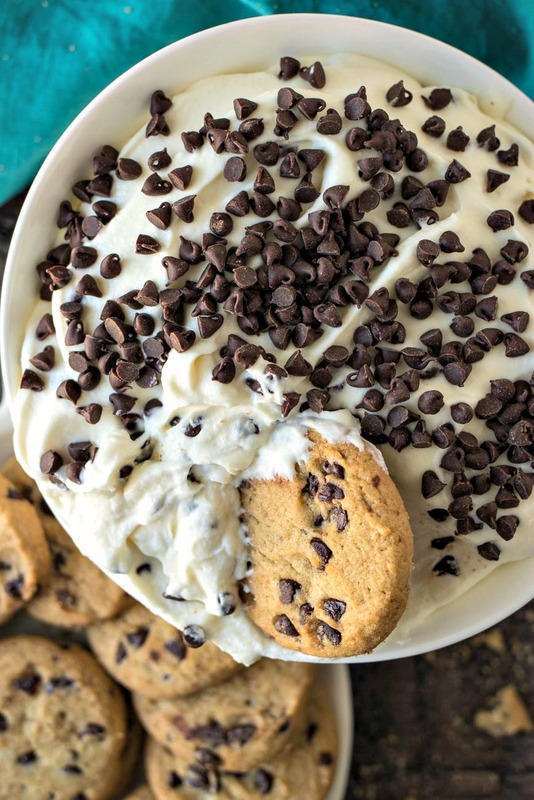 A creamy dessert dip made from whipped cannoli filling using real marscapone cheese and served with chocolate chip cookies! Combine cheeses, extracts, and powdered sugar into a large mixing bowl of a stand mixer fit with a paddle attachment (or you can use a hand mixer). Whip on medium-high until thick and fluffy, about 5 minutes. Fold in 3 tablespoons of chocolate chips. Pour dip into serving bowl. Top with remaining chocolate chips. Let it set in fridge for about 1 hour and then serve with chocolate chips cookies. can we make it a day or two ahead? This looks absolutely delicious!! I need to make this for my holiday parties coming up. This looks so delish Need to try to make this some time! I love cannoli and this looks absolutely amazing! My hubby would die for this! Goodness, this looks so good!! It would be ideal to serve during the holidays when we have family visiting. Yessss! Love making this dip for guests! This looks heavenly and totally delicious wouldn’t mind having this everyday. This is my favorite dish to bring to holiday parties! People love it and it’s so much easier to make than traditional cannoli! This looks SOO yummy!!! I’m definitely repinning this for later! Sweets are literally my weakness. Oh I hear ya, girl! I am the same exact way! This dip looks absolutely amazing! Need to make this. Perfect for all of the holiday cookies! It looks yummy and easy, so I’ll have to try it! Ah sooo true! I should make this for my next cookie exchange! Never heard of this! It looks absolutely phenomenal! Oh man you have no idea! You gotta try it! This looks yummy! I am going to try it for one of my upcoming holiday parties. Thanks! Such a great idea for parties!! This is to die for! I pinned the recipe for Christmas!